GrowNYC has many opportunities for volunteers to dig in and improve New York City's environment block by block and community by community. Volunteers must be 18 years of age or older. 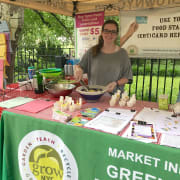 Greenmarket volunteers help with at-market promotions like cooking demonstrations, farmer & customer support, community outreach, Fresh Food Box operations. Attending an orientation is mandatory before volunteering. Visit www.grownyc.org/individual-volunteering for more information and to view a current list of volunteer opportunities. Varies. Shifts are typically 3-5 hours.